Address: Weite Gasse 4, 8001 Zurich. Opening Hours: Tue-Fri 10.30am - 6.30pm, Sat 10am - 5pm. We are very humbled to find Townhouse in this beautiful illustration by Nishant Choksi for Monocle. Our favorite magazine envisioned how the perfect street filled with their favorite city haunts from around the world would look like and we are absolutely delighted to be part of it. 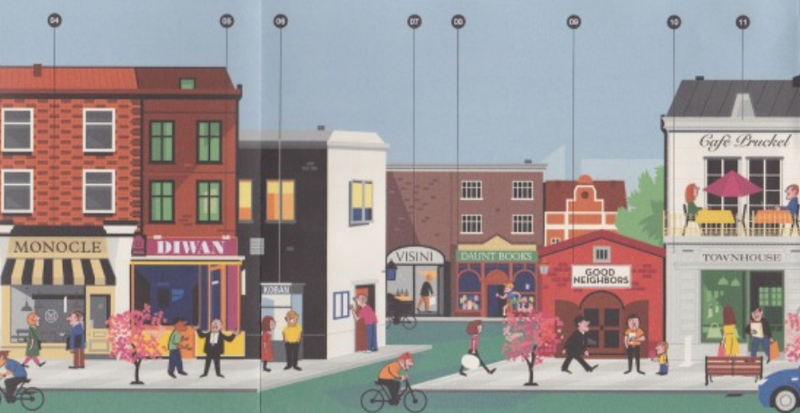 We love the accuracy of the illustration – not only the face of the building, but all details such as our stop trottoir and lamps are shown – and of course the choice of our neighbors. This is the place we would want to work and live. Established in 2009, Townhouse is a Zurich based brand offering clothing, home and fashion accessories with a focus on local design, timeless essentials and quality production. Our collection is compact with only a handful of carefully selected items, eliminating all fanciful details and supporting small manufacturers. We believe in beauty and in quality, in products that are simple yet luxurious. Our shop is located at Weite Gasse 4, just a couple of steps from Bellevue, in the heart of Zurich's Old Town. For questions, please contact us at info@ilovetownhouse.com. Townhouse was founded by Mia Vadasz and her husband Sebastiaan in 2009. Today, Mia is creative director of the brand Townhouse. Both Vogue Germany and The Guardian have featured Townhouse as one of the best new stores worldwide. Townhouse has produced exclusive products for brands such as Unilever, The Leading Hotels of the World and Monocle. Mia has a Masters degree of the University St.Gallen and also co-founded and co-runs Pelikamo, Miaki and Elma & Polina.